Yesterday evening I was with my HID-lamp in Himos ski resort, Jämsä, looking for some haloes. It was full moon, which is no good combination with the lamp, but I managed to get some lamp photos when moon was behind clouds. But nothing special wasn't shown. After driving a few hours around ski resort I managed to find a place where I got some good moon haloes. Unfortunately I didn't notice right away that my camera lens was starting to freeze which is why some of my pictures are a bit blurred. See more photos here ( 1 ). 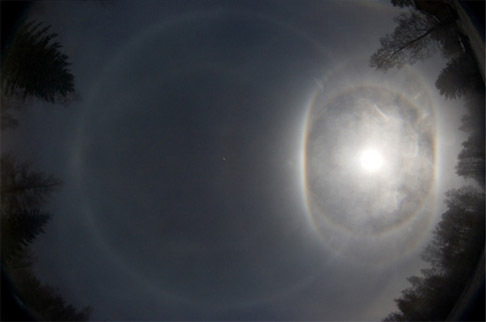 Like the photo showing the complete circumscribed halo and wegener arcs. I also see M-arc in spotlight photo. Nice images, Mika! Great to see that there are good conditions now in the southern part of Finland, as well. Good luck to all of you this season!